J.J. Abrams’ Star Wars: The Force Awakens is more than just one of the biggest blockbusters of all time – it’s also the first chapter in a brand new trilogy. As much as the film was meant to help us catch up on everything that’s happened in the 30 years since Return of the Jedi, the space epic also sets the table for what to expect from the next five years-worth of Star Wars saga movies. Of course, the key hints to what to expect in the upcoming Star Wars: Episode VIII is featured in the final moments of The Force Awakens - and so it’s those final moments that we’re here to analyze. The end of Star Wars: The Force Awakens is an exciting one – featuring a very special reveal and introduction between characters – so let’s dive deep into the events! One could argue that it’s R2-D2 who is really responsible for the kick-off of the Star Wars universe, so it’s only fitting that he be the catalyst character who begins the film’s big conclusion. 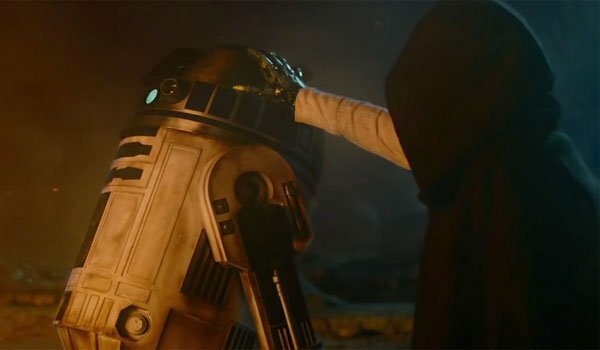 While the little droid is dormant for his introduction in Star Wars: The Force Awakens, he suddenly comes alive after the destruction of the Starkiller Base, and provides a key puzzle piece for which the heroes spent the entire movie searching. While it’s the ball droid BB-8 who carries the missing bit of the map leading to Luke Skywalker, it’s R2-D2 who has the rest of the hologram into which the piece fits. After years of searching, the Resistance has finally learned where the last Jedi is located – and it’s cause for celebration. It’s decided that it will be Rey who goes to find the hero in his isolation, but before she goes, General Leia Organa delivers what would prove to be the final line of dialogue in the movie: "May the Force be with you." After everybody waves goodbye, Rey flies to a blue planet that is almost entirely covered in water – spare for a few rocky islands that rise out of the sea. It’s on one of these landmasses that Rey lands, facing a tall climb up stairs. When she reaches the top, she sees a hooded figure standing on the cliff on the opposite side. She doesn’t say anything, but the figure in brown turns around and we see that it is the legendary Luke Skywalker – sporting a long, grey beard and a metal hand. 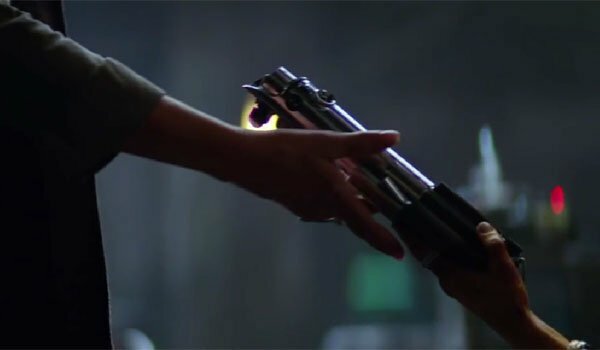 From her belt, Rey removes the blue lightsaber that she found herself drawn to in Maz Kanata’s castle – but, of course, she recognizes that it’s not really hers. The weapon deactivated, she extends it towards and offers to its rightful owner. Luke doesn’t move, and locks in a stare with Rey… and before he can say anything, the screen wipes and J.J. Abrams’ credit as director appears in blue on a starry background. Star Wars: The Force Awakens’ final scene is very clearly a tease for what we can expect to see in Rian Johnson’s Star Wars: Episode VIII on the whole, but let’s start our analysis by discussing what the ending means for both of the characters involved, shall we? When you think about where she started and where she ended up, you’ll realize that Daisy Ridley’s Rey went on one hell of a journey in Star Wars: The Force Awakens. When we first meet her, she is a ship parts-hunting scavenger who lives inside an AT-AT on the desert planet Jakku, and by the end she is holding a lightsaber and getting face time with Luke Skywalker (a guy who has existed to her practically on the same mythical character level that he exists to you or me). And the fact that she is the one holding the meeting says a lot about how far she has come and the path that she is on for Star Wars: Episode VIII and beyond. 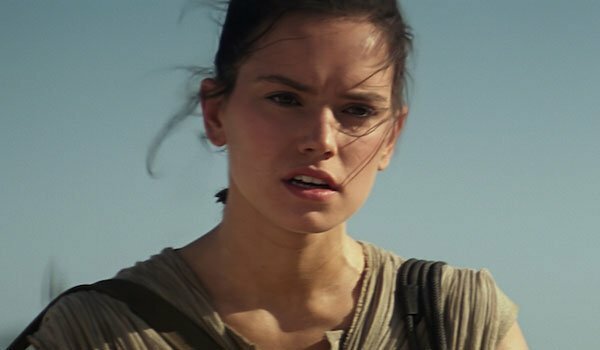 Considering that she had only arrived at the home base of the Resistance just a few hours before what would wind up being the destruction of the Starkiller Base, Rey earns the respect of the higher-ups pretty damn quick, as indicated by the fact that they let her go to see Luke Skywalker one-on-one. Clearly they have an awareness that the young girl is sensitive to the Force, but given how long Luke has been gone, it’s strange that more people wouldn’t be fighting for the chance to go with her. Specifically, why wouldn’t Leia want to go as well? The only answer I can think of is that it would be too emotionally difficult for Luke, given that he failed to train her son, Ben, and let him become the Dark Side representative known as Kylo Ren. Of course, it’s Rey’s demonstrated Force sensitivity that makes her introduction to Luke so fascinating. Throughout Star Wars: The Force Awakens, we see her demonstrate some famous skills – including mind tricks and telekinesis – but she is still completely untrained in the ways of the Jedi and surely doesn’t understand the full capacity of what she will be able to do. The one person in the universe who can actually help her in this respect is the guy standing on the other side of the island. On beyond Rey learning how to use her gifts, there is also the question of exactly where those gifts come from. It’s been suggested that access to the Force comes packaged with genetics ("the Force is strong in my family"), but that’s certainly not the only way a person can wind up becoming Force sensitive. This, naturally, leads to a debate: is Rey related to a Force sensitive character that we know (a la Ben Solo), or is she just plain old special? As I hinted at in my spoiler-free review, I will admit to being disappointed that Luke Skywalker wasn’t featured more in Star Wars: The Force Awakens. His reveal at the end is certainly dramatic, but feels like we were set up for a lot more. It turns out that J.J. Abrams, Mark Hamill and Co. couldn’t really talk about Luke’s role not because of spoiler purposes, but because he doesn’t really have much of a role. That aside, the character’s absence certainly does have a huge impact on the film’s story, and the ending provides an interesting hint about the past and future. The opening scrawl of Star Wars: The Force Awakens notably begins with "Luke Skywalker has vanished" – and really the entire movie revolves around this fact. The First Order’s primary mission is to kill Luke and end the Jedi forever, and General Leia Organa knows that the only way to restore peace and justice to the universe is if her brother returns and backs the Resistance. But the legendary Jedi has been isolated for a very long time, and it shows in his demeanor and appearance in the final scene of the film. On that note, let’s discuss the fact that Luke doesn’t exactly look thrilled that anybody has actually made an effort to find him – let alone a strange girl who somehow got his long-lost lightsaber. His slow turn towards her and the fact that he doesn’t immediately say anything suggest that he hasn’t exactly been waiting, or has even been expecting her. This is a man who is pretty clearly in a bit of an emotional state, and with good reason. Going by what we learn over the course of Star Wars: The Force Awakens, Luke’s world was rocked pretty hard by the fact that he was unable to steer his young nephew to the Light Side, and ultimately lost him to the Dark. This was not only a personal failure on his part, but also a terrible thing that effects the two people in the universe he cares the most about: Han and Leia. Rey may seem like a viable candidate to be trained in the ways of the Jedi, but there is a big question as to whether or not Luke will actually be up for the task. So now that we’ve looked at the main players in the final scene of Star Wars: The Force Awakens, let’s talk about how it points the franchise in certain directions for Rian Johnson’s upcoming sequel. Here’s something interesting to think about: while the final scene of Star Wars: The Force Awakens seemed like the first part of a much longer sequence, the truth is that we may never see exactly what went down between Luke and Rey during their first meeting. There has never been a Star Wars sequel that has picked up immediately after the events of the previous film, and part of that tradition comes from the opening scrawl. Presumably Rian Johnson won’t want the opening words of his movie to just be a quick recap of what audiences have already seen, which means that some time will have to pass between the installments. That being said, what the ending certainly does promise is an expanded role for Luke Skywalker in Star Wars: Episode VIII. While having the character "vanish" was an excuse not to have him prominently featured in The Force Awakens, that excuse is most definitely off the table for when the next sequel rolls around (we’re not going to buy that he’s vanished again after meeting with Rey). Naturally, this brings up the question of exactly what Luke will be doing in Star Wars: Episode VIII, and naturally the assumption is either training Rey to become a Jedi, or specifically not training her. After what happened to Ben Solo, he may fear that he doesn’t actually have what it takes to take on a new Padawan, and could fear that he will ultimately steer Rey in the same dark direction as his previous apprentice. On a side note, one also has to wonder if an expanded role for Luke Skywalker means that Leia Organa will potentially have a larger role to play in Star Wars: Episode VIII as well. Not only will she certainly be interested in the potential reemergence of her long-lost brother, but there’s also the fact that Han was killed and that she remains the single parent of the new trilogy’s central antagonist (and he would probably be more than happy to kill her as well). It’s hard to say what may happen in the time jump between movies, but right now Leia is on-course to play a tremendously significant part in the future of Star Wars. Another thread that’s left hanging by Star Wars: The Force Awakens that we’re hoping gets addressed in the sequel is exactly where the map driving the movie’s plot actually comes from. If Luke never wanted to be found, he surely wouldn’t make a map that lays out where he is; and if someone learned where he was and drew a map to it, presumably that would mean that there were people in the universe who knew exactly where Luke was. I’m also curious exactly how Max von Sydow’s Lor San Tekka ended up with just a piece of the map, and not the whole thing (though I’m not confident in ever getting this answer simply because of how quickly he was killed off). 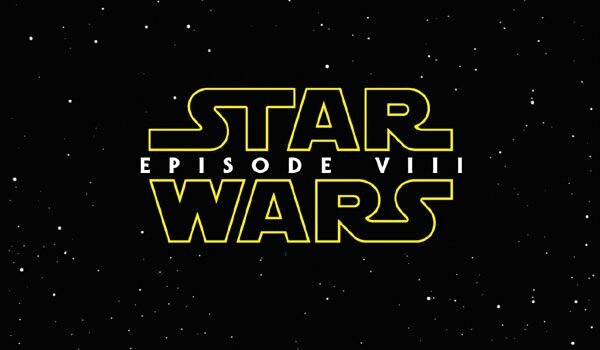 After watching the events of Star Wars: The Force Awakens unfold, where do you think the story will head in Rian Johnson’s Star Wars: Episode VIII? Do you think that Luke will wind up training Rey? Do you think we’ll learn something special about Rey’s ancestry? How do you expect things to play out between Luke and Leia when they get back together? What do you think Kylo Ren’s plans for his mother are? We want to hear all of your thoughts and speculation, so hit the comments below!